Since the release of her 2009 debut record Song Up In Her Head, 19-year-old Sarah Jarosz has firmly established herself as one of the most talented and exciting young musicians in the diverse world of Americana music. In the past year, she has played Bonnaroo, Newport Folk Festival, Telluride Bluegrass Festival, performed on A Prairie Home Companion, been nominated for a Grammy and an Americana Music Association award, and won three Texas Music Awards. This Tuesday, Sarah released a two-song “45” that includes her original composition “My Muse” and her cover of Bill Withers’ “Grandma’s Hands”. 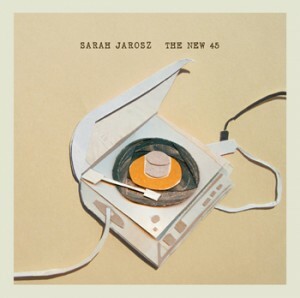 Titled “The New 45”, the release is available digitally on iTunes and AmazonMP3, and a very limited supply of vinyl 45s will be available on 11/22 at www.sarahjarosz.com and at select retailers. Also, the Austin City Limits episode featuring Sarah Jarosz will air nationwide this Saturday, November 6th. Taped earlier this year, the episode also features Steve Martin and the Steep Canyon Rangers. Sarah Jarosz – Austin City Limits Preview from Sugar Hill Records on Vimeo.